What Do PA’s 6 Legal Sportsooks Have Planned For The Super Bowl? The Steelers’ once-promising season ended in collapse and controversy, with Antonio Brown on the sidelines and Pittsburgh’s playoff hopes resting on, of all teams, the Cleveland Browns. The Eagles’ Super Bowl title defense ran hot and cold and ended with the ball slipping through normally sure-handed Alshon Jeffrey’s fingers. So football fans in Pennsylvania aren’t necessarily as pumped for the big game on Sunday, between the L.A. Rams and the New England Patriots, as they have been in other recent years. Thankfully, the arrival of legal sports betting gives them a new reason to be as invested, so to speak, as ever. Since November, six venues have opened brick-and-mortar sportsbooks in the Keystone State, and with online/mobile betting still seemingly a few months away, a trip to the casino is the only way to bet legally in the state. As you’d assume, it’s “prop ‘til you drop” at all of the books, with a wide menu of betting options everywhere. And for their first Super Bowls, some of the venues are taking extra steps to make the sportsbook the perfect place to spend your Sunday. We’ll look first at the casino that opened its sportsbook first. There’s no competition in this part of the state, near Harrisburg; Penn National is the only game in town when it comes to legal sports betting. Hollywood Casino’s William Hill Sportsbook opens at 9 a.m. Sunday, with a full assortment of props available. One highly intriguing number: They have Rams QB Jared Goff at 7/2 to win MVP, when he’s in the neighborhood of +200 at most books. If you think L.A. can pull off the mild upset, +350 on Goff as MVP might be the smart way to go instead of +120 on the Rams moneyline. Like Hollywood, there’s not much in the way of competition for Rivers Casino in Steelers country. Rivers’ 3,000-square-foot sportsbook has seating for just shy of 100 guests, with a 14’ x 7’ LED video wall and 15 additional flat-screen TVs. But it’s mostly business-as-usual there on Super Bowl Sunday. Will Donald have a sack? Will Donald have the game’s first sack? Which number will be higher: Donald sacks or Rob Gronkowski touchdowns? Unlike the central and western parts of the state, the Philadelphia-area market is crowded and competitive. 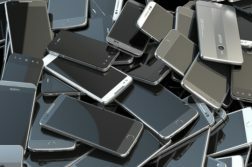 The bettors at SugarHouse are collectively expecting a high-scoring game, as so far, 70% of the bets and 83% of the money are on over 56½ points. Club chairs and table seating in SugarHouse’s 1,800-square-foot temporary sportsbook accommodate approximately 70 guests, and additional seats and viewing are available in the casino’s Fishtown Hops bar. The betting odds and options are mostly the same at these two Greenwood Gaming properties (and can easily be found online thanks to the Parx Betslip Builder), so which location a football fan chooses might come down to location and convenience. If you’re near the stadiums in South Philly, the Turf Club makes sense. If you’re in the ‘burbs, maybe you go with Pennsylvania’s most popular casino, Parx in Bensalem. Need a tiebreaker? 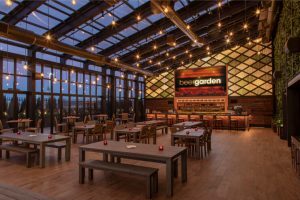 Parx is hosting a “Big Game Watch Party” in the new Beer Garden and Liberty Bell Gastropub, and beloved former Eagles running back Brian Westbrook will be making a guest appearance. At Parx’s temporary sportsbook, seating is limited. That makes the beer garden, which opened last weekend, a welcomed game-day addition. Looking for food and drink specials? On Super Bowl Sunday, it’s just $9 for any Pub Wings order, short rib poutine, burger from Liberty Bell, or pizza from Oliveto, and a mere $3 for Bud Light, Yuengling Lager, and Goose Island IPA 10-ounce drafts. Oh, and for Eagles fans with fond memories of the “double doink” a few weeks ago, Parx and the Turf Club are offering a Super Bowl prop bet on whether a kick will hit the upright. Sorry, Bears fans. 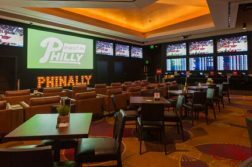 South of Philly in Delaware County sits the latest sportsbook to open in PA, and Harrah’s Philadelphia is trying something a little more ambitious in terms of accomodations for the big game. Harrah’s is hosting a Super Bowl Party in its Event Center starting at 5:30, with an all-you-can-eat buffet and a cash bar. The cost of admission is $50 per person. Meanwhile, at the brand new sportsbook, appropriately named “The Book,” seats range from $50 for a bench seat, to $75 for a bar seat, to $100 for a stadium chair, covering food and access to a cash bar. Granted, paying money for a place to watch the game isn’t for everyone. But, for starters, the money does cover your food. And more to the point: If you make big enough bets on the game, it’ll all just feel like a very small vig.